Mr Tan, an architect, hires 10 architect assistants who are foreigners, and needs to apply for work permits for them to work in Singapore during his project. The application of work permits is in the capacity of his architect business and thus, will require the registration of a UEN, making him eligible for CorpPass. He can then log in to Ministry of Manpower’s (MOM) digital service using CorpPass to apply for the required work permits. As a freelance architect, Mr Tan can continue using SingPass to submit building plans to Building & Construction Authority (BCA). Refer to the CorpPass Glossary for the most commonly used terms in CorpPass. What are the types of CorpPass roles and accounts? Applicable only for Singapore registered entity with Unique Entity Number (UEN). What is a CorpPass Administrator (Admin)? A person authorised to create CorpPass accounts and manage access to digital services for the entity. The appointed Admin may be a person who currently manages Government-to-Business (G2B) transactions on behalf of the company. Examples of who may fulfil this CorpPass role include: Director of Corporate Services (Admin / Finance / Human Resources) or any person(s) authorised by the RO. For Singapore registered entities with UEN, Admin must be authorised by the Registered Officer (RO). For smaller organisations, the RO may assume the role of a CorpPass Admin. *Note: Each entity can only have a maximum of 2 CorpPass Admins. Find out who is your entity's CorpPass Admin/Sub-Admin here. Who is eligible for CorpPass? a. Singapore registered entities that has been issued a Unique Entity Number (UEN) by UEN-issuance agencies. For more information on the eligibility requirements for UEN Entities, click here. What is a CorpPass Sub-Administrator (Sub-Admin)? A person authorised by the CorpPass Administrator (Admin) to help manage CorpPass accounts and digital service access on behalf of the entity. 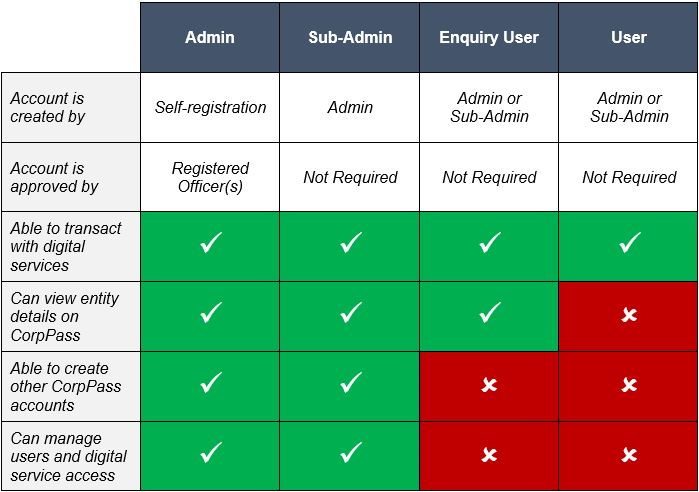 A Sub-Admin has full management rights to CorpPass users’ digital service access, unless restricted by the Admin. Sub-Admin accounts can only be created by the Admin, and do not require approval. Similar to the Admin, the Sub-Admin can create other CorpPass accounts (i.e. CorpPass Enquiry User, CorpPass User) for users within the entity.